Biopharmaceutical medicinal products (biologics) represent a huge financial market. Thus upon patent protection expiry of the innovator (reference) biologic there is interest from industry to gain a portion of this market by launching a 'similar' biologic at a reduced development cost, thus boosting potential gains. The EMA responded to this desire and lead the guidance process with industry on the topic of biosimilars. 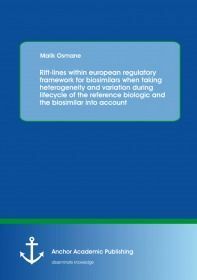 Based on the experience gained with biosimilars in the past, the EMA started to introduce a second generation series of guidance documents, which take into account the past, current and possibly future challenges of biosimilars. Those proposals were evaluated by EMA and partially incorporated into new guidance documents. This work highlights the challenges and risks associated with biosimilar submissions for large and complex bio-molecules such antibodies. Results: There are unaddressed questions for the regulator with regard to the unsolved dynamic of heterogeneity and variations of the quality profile, which have potential implications on safety and efficacy. This is neglected and not taken into account seriously enough by the stakeholders. Solution: Further, the only (in my view) progressive way to deal with such foreseeable situations from the biosimilar developer’s point of view is to incorporate a design space.